At least 75 people are reported to have been killed and many more injured when a powerful earthquake struck north-eastern Burma on Thursday. The magnitude-6.8 quake struck near the Lao and Thai borders, and was felt as far away as the Thai capital Bangkok, and in the Vietnamese capital, Hanoi. The town of Tachileik and surrounding villages in Shan state appear to have borne the brunt of the earthquake. There are fears the casualties could be much higher. Burma is ill prepared to deal with natural disasters, says the BBC's Rachel Harvey in Bangkok. Communication systems and infrastructure are poor and the military government, still in charge until the handover to a new civilian-led administration, tends to limit the flow of information. It is likely to take some time before a clear picture of the disaster emerges, our correspondent says. 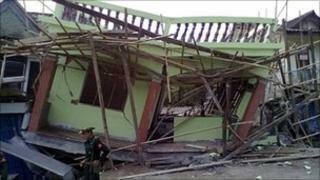 Several hundred buildings collapsed north of the town of Tachileik, in mountains near the border with Thailand. Local people told the BBC that in the villages of Tarlay and Mong Lin alone more than 60 people had been killed. Roads and bridges have been damaged making affected areas hard to reach. "We are trying to reach the remote areas," one official told AFP news agency. "The military, police and local authorities are trying to find some people injured in those affected areas but the roads are still closed." The earthquake hit at 1355 GMT on Thursday and was centred about 70 miles (110 km) from the northern Thai city of Chiang Rai, the US Geological Survey (USGS) said. The quake was shallow, at a depth of 6.2 miles (10km). The tremor was felt in many parts of neighbouring Thailand. One woman was killed in the border town of Mae Sai and slight damage has been reported to some buildings but major towns and cities appear to have escaped relatively unscathed, our correspondent says. In neighbouring Laos, no casualties have been reported. On 11 March, a 5.4-magnitude earthquake struck just north of the area, 225km (140 miles) southwest of Dali in Yunnan, southern China. That was the same day as the 9.0-magnitude quake and tsunami hit Japan; however, Japan is on a different tectonic plate.